Even though I hear it is not a super popular tradition in England to have a baby shower, I am still pretty excited to have one. 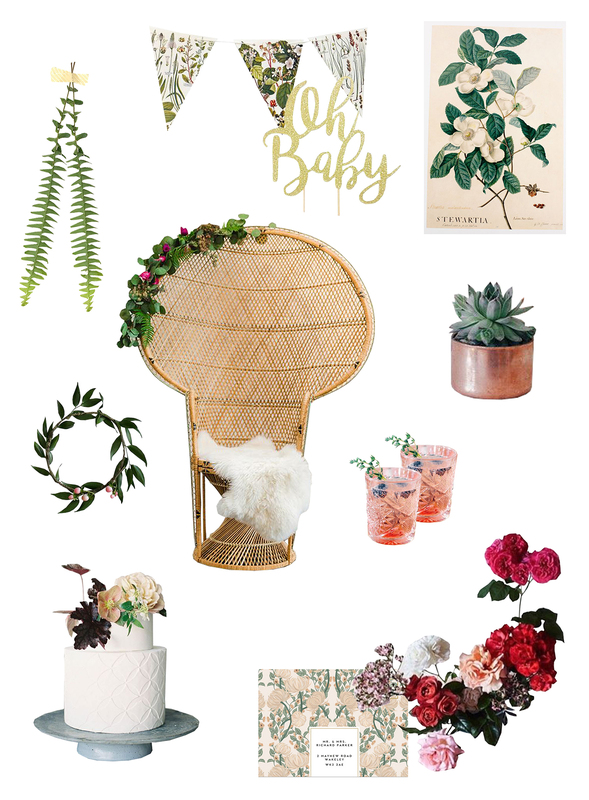 Since I have been so into the botanical vibes recently, I wanted to use this (slight obsession) as inspiration for the design of a baby shower. I also didn’t want to go overboard in the “cutesy” accents, but I thought that infusing in some green elements and bohemian flair would give the get together a fun and casual feel while still being feminine and upbeat. Check out below my inspiration board for the shower. Invites: I have found these beautiful vintage inspired invites from a company called Tuppence Collective. I instantly fell in love with them. Cake: Still my favorite bakery in London is Lily Vanilli. Their cakes are insanely gorgeous … covered in edible florals and fruit. I saw one on their Instagram of an enchanted forest theme which fit really well with all the greens for this party. Venue: There are a few super bright and green spaces in London to have a little party. Some of my favorites include, The Ivy Chelsea Garden private room (which is covered in vintage botanical prints) , Bourne & Hollingsworth (incredible private room draped with live greenery and mis-matched garden vintage garden furniture and Spring Restaurant at Somerset House (which is named pretty much perfectly to go along with its bright and pastel interior). Botanical Bunting: I spotted these here and love them! Cake Topper: This sparkly “Oh Baby” one is pretty much perfect. Flowers: One of my favorite florists in London are Early Hours. They create such beautiful floral installations (I would call it artwork really) for restaurants and events all over the city. I would love to use them for the flowers! There is more to come on this but wanted to share my current inspiration and also my sources for an upcoming baby shower (in the works)! I will post about it again soon!